The project is framed by focusing on three case studies, namely the iconography of the Infant Saint John the Baptist, the iconography of the Blessing Christ and the iconography of Mount Calvary and the Good and the Bad Thief. These cases will be representative for the vast amount of religious images produced during the period, which migrated from Northern Europe to Southern Europe and vice versa. For example, even though the iconography of the Infant Saint John the Baptist was tied to Florentine customs, this iconography spread throughout Italy and Northern-Europe from the end of the fifteenth century onwards. The most famous example of this motif surfacing outside of Florence is the Virgin of the Rocksby Leonardo da Vinci (1452-1519), an altarpiece commissioned by the Confraternity of the Immaculate Conception for their oratory of the San Francesco Grande in Milan. In this painting, the Infant Christ Child and the Infant Saint John the Baptist are interacting with each other. 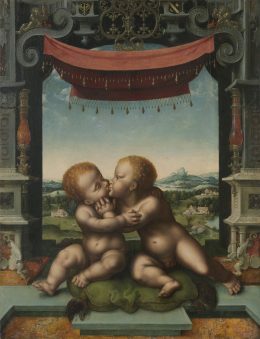 Moreover, Netherlandish artist Joos van Cleve (c. 1485-1541) produced multiple very typical paintings with the infant Christ and Baptist embracing. These paintings derive from Leonardesque prototypes. The motif of the embracing children also found favour with Leonardo’s Milanese followers as there are several extant paintings by Marco d’Oggiono (c. 1470-1549), Bernardino de’Conti (1470-1523), and Bernardino Luini (c. 1482-1532). The migration and adaptation of this motif from Southern to Northern Europe is one of the examples investigated in this PhD project. By analyzing representative cases of migrating religious motifs, the project will provide new insights of artistic connections between the Southern and Northern regions. By focusing on the commissioner, or lack thereof, and the producer, and therefore looking into the role of religious background and institutions, the proposed research will provide insights into the history of ideas through images. These new iconographies were used to convey new ideas, and as instigators for new ways of experiencing Christian faith.